Ten generations from Adam to Noah culminate in the Flood, followed by God's covenant with Noah. Ten generations from Noah to Abraham culminate in the fall of the Tower of Babel and the dispersal of the nations. -1760 B.C.E. TO 240 C.E. Exodus from Egypt & Giving of the Torah. Dispersal of Jews throughout the world. Trials of the long exile. Persecution. Repentance and ingathering of the exiles to the Land of Israel. Kabbalistic teachings of Rabbi Shimon bar Yochai collected and written down in the Zohar, kept secret for 1000 years. Manuscripts of the Zohar begin to be circulated by Rabbi Moshe de Leon (1238-1305). 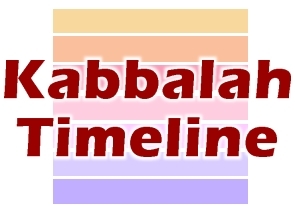 Knowledge of the Kabbalah is spread by outstanding scholars, such as Rabbi Judah the Maharal of Prague (1512-1609), Rabbi Isaiah Horowitz, SheLaH (1565-1630), Rabbi Moshe Hayyim Luzzatto, Ramchal, (1707-46) and Rabbi Elijah the Gaon of Vilna (1720-97). Knowledge of the Kabbalah spreads from Israel to scholars throughout the Diaspora. Revelation of Rabbi Israel the Baal Shem Tov (1698-1760) as leader of the network of hidden Kabbalistic tzaddikim.